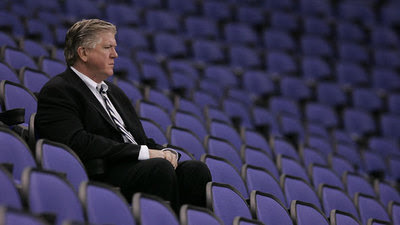 Think what you like about Brian Burke and his performance as GM of the Leafs. As an outspoken opponent of cap-skirting, mega contracts, Burke has voiced his disapproval clearly and often. He even testified against the Devils/Kovalchuk contract last off season. So what was Burke to do when a truly elite center-man, which held the primary spot on the Leafs' shopping list, hit the UFA market? "... We made a very substantial offer to Brad Richards. What we offered I don't think is material, but we lost out on the Brad Richards sweepstakes for two reasons. One, we didn't offer as much money as other teams, and more importantly, we didn't structure the contract like other teams did. These deals that are front end loaded and have small amounts at the back end, in my opinion are designed to circumvent the salary cap. I won't do them. I never have. I'm not going to, and that's why we were unable to sign Brad Richards. I wish him well. He's a good guy, but that's not a contract structure we are interested in." Front loaded contracts are not Burke's only pet peeve when it comes to signing players. Bad blood still exists between Burke and Kevin Lowe regarding Lowe's RFA offer sheet to Dustin Penner. "An offer sheet? I don't contemplate doing one right now." "Because I don't contemplate doing it at this time. Offer sheets are part of our CBA, and if teams want to make them: fine. I do not contemplate adding a player in that manner." If Burke is to be an influence among his peers, he cannot spout off against the actions of other teams, which he hints at operating in an unscrupulous manner, and then participate in the same practices of which he is so critical. Burke knew what it would take to land Brad Richards. Yet, he wasn't willing to do it. So tell me Leafs fans, is it better to have Burke keep his integrity and credibility, or to have the freedom to add any player of need, regardless of the consequences of doing so? Furthermore, is the team better off not spending wildly in free agency or by chasing after expensive RFA acquisitions? he is a business man and he is first a business man and then a fan. We are the same at Host PPH, business first and then entertainment.